Our greatest education in life is not sought, but stumbled upon. 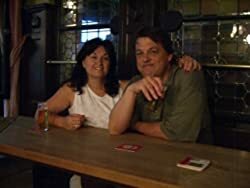 That's me and my wonderful wife in a brewpub in Koln, Germany. We live in Huntington Beach, California, home of the sushi-inspired surfer riot. I write when I am not fly-fishing from my kayak or trying to run 14 errands within a two-hour window. Yeah, I know the picture is dark - but hey, who cares what I look like? You're a reader, right? Nothing to read here, folks--let's move along to the book sample. Please enter your email address and click the Follow button to follow Andy Kasch!